Zemic Europe: DAMTECH Egg-Handling BV is a fast growing Dutch company, that builds a variety of machines. In the last 8 years their activities have increasingly concentrated on the automation around the egg. They have designed high-quality products that are used daily in the poultry sector, for example egg packing machines and egg sorting machines. Recently DAMTECH contacted Zemic Europe because they were convinced that weighing would be an interesting opportunity within the poultry industry. Zemic was excited to help DAMTECH to develop a state-of-the-art egg weighing and sorting machine. The prices of eggs are under pressure, this forces the farmers to innovate. DAMTECH develops machines to offer farmers a sustainable solution for the future. DAMTECH was looking for a partner to help develop an innovative egg-sorting machine. They would like to weigh the eggs, but weighing was a new topic for them. Zemic has a very wide program of sensors and more than 30 years of experience in the field of weighing. Zemic has a strong focus on creating value for her customers to help them to differentiate themselves in their market. In this case the goal was to realize an efficient process for egg sorting for farmers, where careful treatment of the eggs must be combined with speed. Zemic could give the needed professional support and advice for the best fit loadcell and weight transmitter. The Egg-Grader is developed with the L6N single point loadcell and the T1 weight transmitter of Zemic. For weighing eggs there are 5 different classes between 43 and 73 gram, so thorough weighing is necessary. With the components of Zemic DAMTECH has produced an egg sorting machine to sort automatically 4800 eggs an hour per line. Each machine can have up to 6 lines, so in total 28800 eggs can be weighed and sorted per hour. They do 1 measurement per 300ms. For calibrating they have typical calibration eggs. 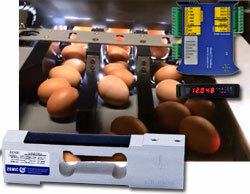 DAMTECH offers different models with different capacities (number of eggs per hour). The Egg-Grader is specially developed for farms, who are selling their commercial eggs straight from the farm. In order to develop an ultimate grader with high capacity DAMTECH had studied their customer’s needs. The following requirements where and still are leading during developing this grader; Accuracy, Reliable, Compact, Weight, Easy Maintenance, Plug and play and Price. DAMTECH has their production facility in the Netherlands. They can ship the machines to anywhere in the world. The added value of the Egg-Grader is already seen by many customers, they are already working with the new system. DAMTECH is also working on a number of new large projects. The Top-Sensors weight transmitters offered by Zemic Europe are suitable to connect directly 1, 4 or even 8 loadcells directly to the device. A weight transmitter provides excitation voltage which is needed for a loadcell or load cells (the input). Weight transmitters convert the weight signal (in general 2 or 3 mV/V at full scale) into a 4-20mA output, 0-10V output, 0-5V output or communicate by fieldbusses like Profinet, Profibus, CanOpen, Devicenet, Ethernet etc.